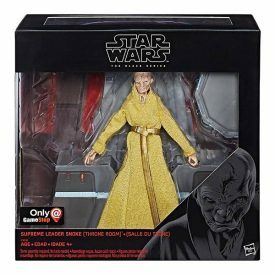 If you are still looking for the TBS6 Supreme Leader Snoke (Throne Room), ThinkGeek.com has it for half price ($19.99). Click here to order. Even better, if you are lucky enough to find one at your local GameStop, order at Gamestop.com for in-store pickup for just $9.99. ← WOW! TB66 [P3] Wave 22 ONLY $50 At Entertainment Earth! GameStop Exclusive TBS6 [P3] Supreme Leader Snoke $10! JTA reader Edward C.D. sends us a great store report. He managed to score the GameStop exclusive Supreme Leader Snoke (Throne Room) for $10 (which is 50% off of the clearance price). 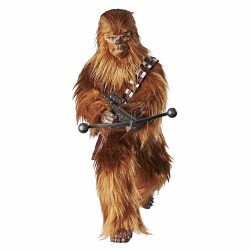 Why aren’t fans of The Last Jedi buying these in spades? He writes “Got this at GameStop in New Paltz, NY. 50% off all clearance… Snoke is worth $10, surely! Still some great surprise finds out there.” Proof is below! ← Sponsor Announcement: Empire Toy Shop! Exclusive JTA Promo Code! Gamestop BOGO Deal Has Some Great Savings! 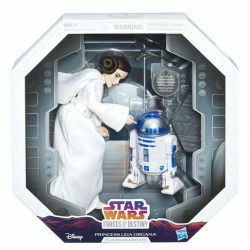 Gamestop.com is having a Buy One Get One 50% off deal and you can order the new Forces Of Destiny Platinum Edition Princess Leia on sale for only $43 (or Roaring Chewbacca for only $23) or get two of them for $65! Better yet, you can mix and match with Pops! and a TON of other Star Wars collectibles. Supreme Leader Snoke (Throne) is $31.99. ← Awesome Funko Pop! Figures Deal At Kohls.com! Supreme Leader Snoke (Throne Room) Back In Stock! 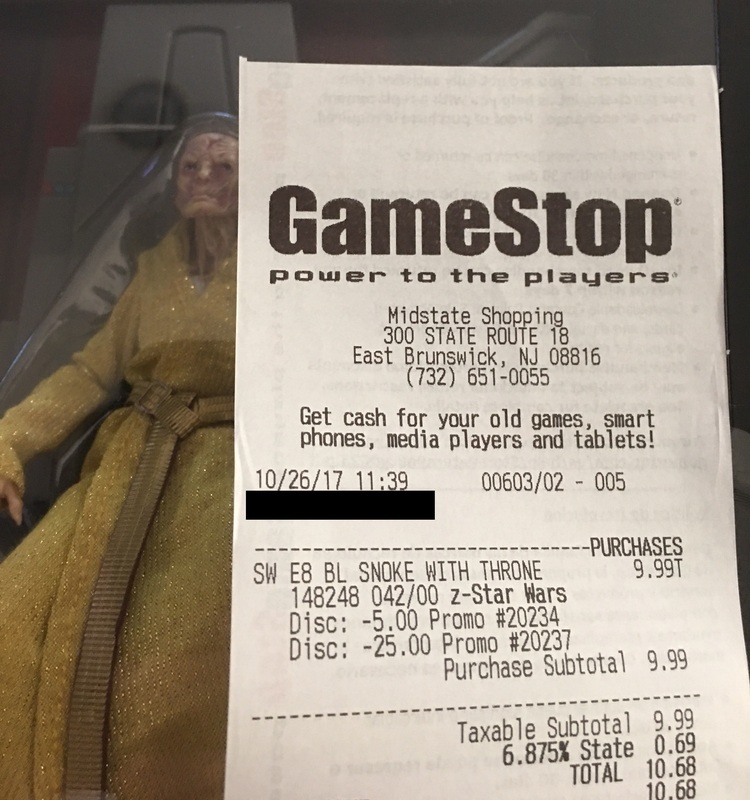 The Supreme Leader Snoke (Throne Room) GameStop exclusive in BACK IN STOCK if you still need it! Special thanks to JTA reader Craig for the alert! 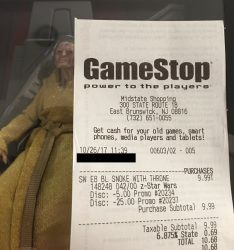 Gamestop Exclusive TBS [P3] 6" Snoke Showing Up In Stores! If you’re still looking for the Gamestop Exclusive Supreme Leader Snoke, Gamestop has started to get them in-store. However, I was only able to find stores that had him”in stock” by using the Gamestop App. Another issue is that a lot of the Gamestops only had the pre-orders, but luckily my local Gamestop had gotten some in. Be sure to call and check before you make the trip! Special thanks to JTA Reader Richard for the tip! ← Supreme Leader Snoke (Throne Room) FINALLY Shipping! Check out tonight’s featured Visual Guide Update, the GameStop exclusive Inferno Squad Agent. Click below for our full guide page. This was also today’s featured review! Click here for the full review. Supreme Leader Snoke (Throne Room) FINALLY Shipping! We are receiving a flood of reports that the GameStop exclusive Supreme Leader Snoke (Throne Room) figure is finally shipping despite one delay after another. (It’s out fo stock now, but the product page is RIGHT HERE if you’re interested.) If you haven’t placed your order yet because you need more persuading, be sure to check out our full review and gallery on this nice release HERE. It’s time to check out the GameStop exclusive Inferno Squad Agent. This Star Wars: Battlefront II character is pretty cool as well as the focus of our Research Droids Reviews today! Be sure to leave your own thoughts in our comments section, vote in the poll or even leave comments about it on our Facebook page. Click the banner below for the direct link to the review! As always, you can also send your own personal review requests via email if you’d like to see something that we didn’t cover yet. ← A 4th Wave Of TBS6 Figures Before The End Of The Year Would Be Cool! Gamestop Exclusive Inferno Squadron Pre-Orders Now Shipping! After all the confusion of charging cards and changing dates, shipping confirmation notices have begun making their way to customers for their The Black Series [P3] 6″ Gamestop Exclusive Inferno Squadron Agent. Now we just all need to cross our fingers and hope they arrive in one piece! Have you received your confirmation yet? Let us know! TBS6 Inferno Squadron Agent Figure IN STOCK At GameStop! Hurry! 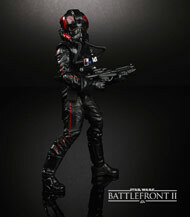 The Inferno Squadron TIE Fighter Pilot GameStop exclusive in IN STOCK! Uh-oh, some The Black Series 6″ collectors are going to be upset! Click through for more. That’s right…after many, many, MANY delays and date changes they have FINALLY sent out shipping confirmations for the Gamestop Exclusive Supreme Leader Snoke Throne. Phew…what a wait that was! If you haven’t gotten one yet, I highly recommend that you do! It is currently sold out at Gamestop.com, but you might be able to start checking stores this next week. It’s an awesome piece and that has great diorama potential with Kylo Ren (Throne Room). If you haven’t seen it yet, be sure to check out our review of Snoke and see why he’s a must have. ← AllPosters.com 60% Off Site-Wide Until Tomorrow Night! The GameStop exclusive Supreme Leader Snoke (Throne Room) gets added to the The Black Series [Phase III] six inch figure Visual Guide today. Click below to take a look at the full guide for this figure. Make sure to also check out our review page for additional images, stats, commentary, discussion, and more. It looks great, but will we care by December? Check out the GameStop exclusive Supreme Leader Snoke (Throne Room) in our Research Droids Reviews today! Be sure to leave your own thoughts in our comments section, vote in the poll or even leave comments about it on our Facebook page. Click the banner below for the direct link to the review! As always, you can also send your own personal review requests via email if you’d like to see something that we didn’t cover yet. Does Snoke (Throne Room) Connect To Kylo Ren (Throne Room)? Find Out! Are you interested to know if Supreme Leader Snoke’s Throne Room attaches to Kylo Ren’s Throne Room? Of course you are! We have taken a few quick pictures to show you if they are able to connect together, and even added a few extra figures to recreate a scene that we don’t even know if it exists! Click each thumbnail below for the reveals! If you’re interested in learning more about these figures separately, be sure to check them all in our in our Research Droids Reviews RIGHT NOW! We also have a sneak peek of the GameStop exclusive The Black Series [Phase III] 6″ Supreme Leader Snoke (Throne Room) figure. We’re unable to see any of the interest this figure has created in so many fans, but whatever. This new villain in The Last Jedi looks like a recycled Emperor Papatine more than anything to us, but the 6″ figure is well made regardless. With premium soft-goods and some awkward features (Is that his ring or is he just happy to see us? AND Is that cod piece a leftover prop from Cameo’s “Word Up” music video?) We’re not sure, but the figure does have some major Hugh Hefner like qualities. Let’s just hope this one doesn’t subjugate women too. Check out the photo gallery now in our Research Droids Reviews. Check out the Barnes & Noble/Gamestop exclusive The Black Series [Phase III] 6-inch “Guardians of Evil” 4-pack in today’s Visual Guide Update. Click below to access the full guide page. Don’t forget to check out our review of this set too, featuring even more gallery images and stats. ← Walmart 40th Anniversary Funko Pop Sets Found! If you’re a 6″ collector and you don’t own the Senate Guard/Imperial Royal Guard/Emperor’s Shadow Guard (Legends)/Elite Praetorian Guard (With Double Blade) four-pack, then you should be shamed by being publicly flogged in your local town square. That’s all we’re saying. 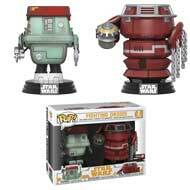 This set is the focus of our Research Droids Reviews today! Be sure to leave your own thoughts in our comments section, vote in the poll or even leave comments about it on our Facebook page. Click the banner below for the direct link to the review! As always, you can also send your own personal review requests via email if you’d like to see something that we didn’t cover yet. ← GameStop: Retailer With The Worst Shipping Ever?